A Perth company is developing a machine that can lay bricks 24 hours a day. At a glance, the benefits of a smart home (a home underpinned by digital technology) are fairly obvious. The ability to repeatedly personalise home lighting, fridges that remind us when the milk is about to expire, and cameras that allow us to play with our pets remotely – this is the kind of stuff 1980s movies predicted, and it’s finally a reality. Dig a little deeper however, and the benefits of smart home technology extend far beyond curbing a bad habit of forgetting to turn off the hair straightener, to also improving society’s environmental impact, health system and housing affordability. “Understanding this experience is crucial to designing homes that can actually begin to more successfully address the needs of people, and policy,” says Dr Sophia Maalsen from The University of Sydney, who is researching the role of technology in smart homes for addressing future environmental and social challenges. 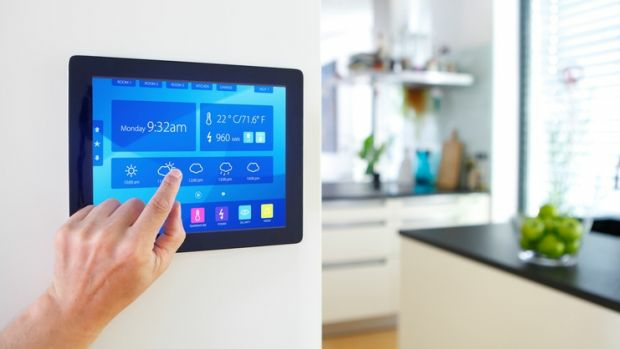 While it might feel like Australians have been slow to adopt smart home technology (especially given the delay in most US-made products becoming available here), experts say our uptake is consistent to that of other Western nations. Discover what implications smart home technology holds for Australian consumers across the following six areas. Health-related smart home technology is somewhat common, with internet-connected products such as the built-in iPhone health app and Fitbit now widely used for tracking physical activity. Beyond these products, smart home technology has the potential to change health care as we know it. For example, some platforms now make it possible to activity track the elderly and people with additional needs, which can support their health and ability to live at home. “The home is increasingly being positioned as a site through which to deliver the health services required as the world reaches its largest ageing population in history,” Dr Maalsen says. Once upon a time, home security systems were a luxury only for more wealthy home owners. Fast forward to today however, and there are hundreds of products responsible for making home safety accessible and affordable. “By implementing solutions like internet-connected cameras, motion sensors for doors and windows, smoke alarms and air-quality sensors, home owners can have greater security and control of their home,” says Sergio Flores, technical product manager for Samsung Electronics. There are also services such as My Home Watch that provide home visits to watch over empty properties (both internally or externally), while also arranging for pet feeding, plant watering, mail collection and virtual monitoring via smartphone. Dr Maalsen points to the advantages housing start-ups such as Airbnb can have on improving housing affordability. “Housing start-ups can help experiment with and suggest new forms of living, which address some of the challenges of high housing costs,” she says. By introducing new products and ways of thinking into the market, it’s possible that the rising issue of housing affordability in Australia may improve. “Successful uptake of technology is always politically, socially and culturally mediated and the successful uptake of a technology is reliant on how it articulates to existing lifestyles, aspirations and patterns of use,” Dr Maalsen says. Smart home products that monitor energy usage have the potential to save consumers money and power, as well as making them more savvy customers. It’s important to note however, that while energy meters can monitor usage, the onus remains on the consumer to actually implement greater change. “Things like smart energy and water meters don’t automatically reduce our consumption – that is still up to us. However, having said that, these technologies do have a benefit if we use them in optimal ways,” Dr Maalsen says. When most people think of a smart home, they think of the products that benefit their everyday lifestyle, from automated window blinds to remotely controlled heaters. “These include smart coffee makers, air-conditioners, refrigerators or washing machines that can be programmed in advance and can adapt to the home owner’s behavioral patterns,” Flores says. These technological advances are not only exciting, but can help save time, hassle and money for the average home owner or renter. Dr Maalsen also cites the benefits of businesses such as Airtasker, which allow people without the necessary tools, time or skills to have odd jobs done. The most common forms of smart technology are in the leisure and entertainment realm, including smart set-top boxes for televisions, multi-room audio systems, and the ability to manage speakers remotely. Services such as Netflix and Stan and have made this technology feel so commonplace that it’s hard to believe they were only introduced to the Australian market in 2015. “The utopian vision of the smart home won’t just suddenly arrive. There will be a continued incorporation of smart into the household,” Dr Maalsen says. We’ve also been employing ADT for the past seven years and assumed I have been paying way too much. There are a couple of nice home security system monitoring choices to choose from which happen to be in essence 1 / 2 the selling price for the equivalent level of service. Definitely worth researching to save bucks most definitely considering the fact that many do not require any written contract that the big dealers demand. Waste.